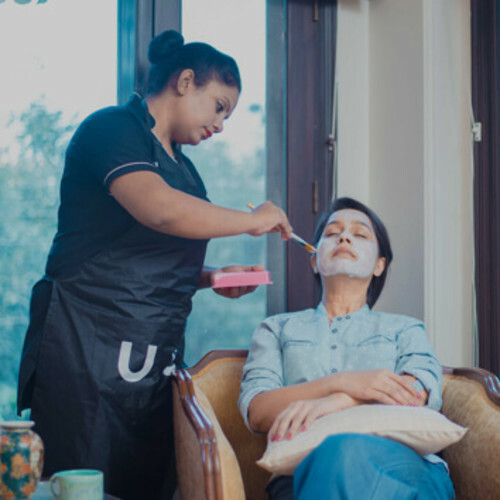 Save your time and effort by booking beauty parlour services like Waxing, Facial, Manicure, Pedicure from senior beauticians at home near you and enjoy hygienic and mess-free service. They only use branded, disposable and hygiene friendly products. Our experts are 4.5+ rated and have an experience of 5 years. Book salon at home in Mumbai and enjoy the service! Excellent.. Facial was really good n relaxing. Service is execellent. She needs to maintain the hyginie and little be organised in terms of products. Service very fast. Head massage was good but cleanup was ok. Massage was fast. Great service, extremely professional and very sweet. A wonderful professional. Soft spoken and punctual. Lovely experience to feel relaxed. Very good Service. She worked with detailing and was very understanding. Extremely well trained and good at communicating to understand what do I require. It was a service better as compared to a saloon. Thanks to Priya. Najma was on time.Excellent and patience would recommend her for everyone. She was smiling all the time . Very punctual & professional . She was fine but forgot to bring a mirror which is necessary if I'm getting my eyebrows done. She also didn't bring the oil that's supposed to be put after waxing. She was clumsy and kept dropping wax on the floor. She did my clean up in a hurry all the while busy talking on phone. I've had the same cleanup done before so I know that this isn't how it's done. After that she requested me to give her good ratings as she's already on a low rating. But her low ratings are justified. No one's going to rate her well if she's going to do her job half heartedly. Arrived without basic equipments like nail cutter for pedicure and mirror for threading. Did arms and legs waxing in positions I have not done in the last 12-13 years and this caused skin to be loose leading to pain and wax spillage. I even had to ask her to stop using the wax strip she was using for me to intermittently remove wax from her own hands (it's just so unhygienic to be sharing someone else dead skin, it was very gross). Without a small mirror, she was trying to use selfie camera mode during my threading, and also close to making my eyebrows 3/4 of what they are, had I not taken the call to ask her to stop. She was very gentle and considerate and experienced. Excellent service by Poonam. Very warm and cooperative. Would prefer her for the next services also. Lata patil was extremely professional..polite. the services provided by her was worth for money. This was my first experience with UC nd Lata made it really special. She was excellent in her work nd her experience could be seen in it. Very happy with the service. I have done root touch up several times before but not satisfied with the provided service. Now taken farhana's service. She had covered all the greys hair very well. Completely satisfied with her service. Waxing is quite painful for me but she calmly and patiently beared with me .. Thanks for it! Rica Wax is a brand of wax, which includes specific essential oils, nourishing vegetable oils, beeswax, Titanium dioxide and other natural ingredients, each carefully chosen for its specific effect on the skin or hair.The advantages of using it include superior hair removal with less pain, with gentle and nourishing anti-inflammatory care. You can use the mobile app and book the same beautician that you have rated 5 stars in the past, using the ‘Rebooking’ feature. The Oil-Control Cleanup can be used for oily skin. It controls excess oil, prevents acne, minimises pores and removes blackheads. Spa Pedicure has the added advantages of a luxurious and relaxing spa massage for feet with tan removal effects. It is especially recommended for people with tired feet, dry cuticles, chipped nails and tanned feet. You change the booking time till3 hours prior to it, through the ‘Reschedule’ feature. While the package cannot be modified, our beauticians are trained to customise the service according to your convenience. Nothing beats getting a hair spa and facial at the comfort of your home but it wasn’t so earlier. For hair spa or facial treatments, you had to head out and the worst part, waiting for an appointment. Luckily, nowadays there are skilled beauticians who offer salon at home services and make sure your hair and skin care requirements are met. Time Saver: When you head out to a salon, most of your day is simply wasted. Once you get there, wait for your turn to come which again takes a considerable amount of time. 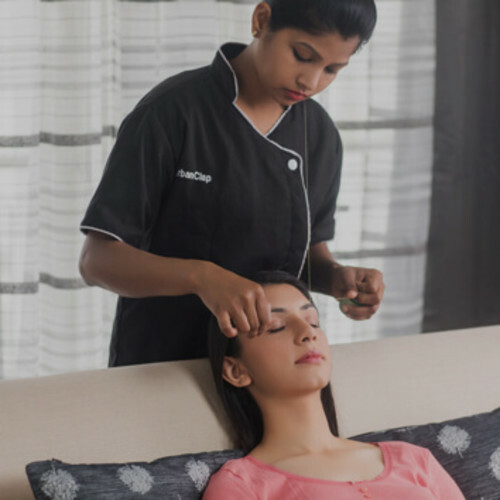 By availing a beauty service at home, you can book beautician when you are relaxed. The beautician will come as per your convenience. Being comfortable: With salon at home services, you can listen to any music and/or read a book while the treatment is going on. You can also choose to take a nap after the skin treatment is done. When you go to salons, you may be unaccustomed to the atmosphere inside. Moreover, leaving the salon right after the treatment can be quite stressful. Relaxed Services: At hair salons, beauticians have to consider all their customers who are waiting in a queue. Sometimes specialists end up completing the beauty treatments in a hurry. Hiring beauty specialists at home is a viable option as they would be available for a fixed period plus no distractions of handling other clients. Group Treatments: Salon at home services also allows you to enjoy a pamper session along with your close friends. The beauticians would let all of you to get ready for any party. That’s not the case with the salon. If you and your besties head to a salon, each of you would be in separate rooms for the treatments which takes the whole fun away. 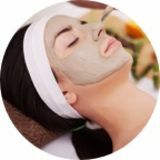 Glow Facials: In this type of facial treatment, the products are used to add a glow to the skin. Anti-aging Facial Treatment: This treatment is intended for people who have wrinkles and fine lines. The products applied with this treatment reduce the fine lines and also, maintain the skin. Brightening Facial Treatment: A brightening facial spa can revitalise any type of skin that is dry and dull. This type of facial treatment is for people whose skin is dehydrated. De-tan Facial Treatment: A de-tanning facial does away with tanning and makes the skin go back to its original tone. The skin also looks lighter. Cleans the pores: One’s skin is affected by dirt and pollution, as the minutely small particles remain in the skin’s pores. Pores can be completely cleaned with exfoliation, which helps to reveal the clear skin. Facial massage: A massage is the most important part of any facial treatment or clean-up. Massaging helps in the circulation of blood, relaxes face muscles, and helps in lymphatic drainage. A facial massage also does away with the body toxins along with enhancing the skin’s appearance. Specific Masks depending on the type of skin: Skin types determine facial masks. A moisturising mask is applied to a person who has dry skin. On the other hand, a water-based mask or gel is applied to remove excess oil from the pores of an oily skin. Most are not aware of how often a facial treatment is required. Skin experts generally say that young people should get a facial treatment once every month and the aged ones should get a facial once every two weeks. It is not only essential to take care of one’s face but it is also important to consider the hands and feet. If the feet and hands are dry and flaky, it indicates that one does maintain his/her body properly. The dry areas can look quite dull. Cut, File & Polish: A cut, file, and polish manicure involves trimming of nails, filing into a preferred shape and applying nail paint. Classic Manicure and Pedicure: This comprises of nail grooming and hand massaging with nourishing hand massage lotions and creams. Nail paint is put on the fingernails later. Spa Manicure and Pedicure: It comprises of products for the removal of dead skin and tanning. Once the massage is over, a mask is applied. The nail paint is put later. De-tan Manicure and Pedicure: In a de-tan manicure special products with de-tanning ingredients are used. To remove the tan from hands, only one session is enough. Soft Waxing: Soft waxing is apt for thin and soft body hair that is on the abdomen, legs, face, arms, and back. After application of the thin layer of soft wax in the hair-growth direction and putting a strip of paper or cloth on the wax, the paper strip is pulled from the opposite way. The wax that is attached to the paper strip and skin pulls the hair off from the roots. 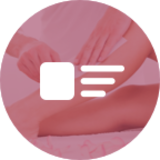 Cold wax and hot wax are the two types of soft waxing. Hard/Peel-Off Waxing: Hard waxing is ideal for thick and coarse hair that is on the bikini area and underarms. It is also suitable for eyebrows. In this type of waxing, a thick sheet of wax is applied on the skin area along the direction of hair-growth and is pulled from the opposite end. As it is the wax itself that is pulled off with the hair in peel-off waxing, paper strips or, cloths are not required. In this hair removing method, a polyester or cotton thread is doubled and twisted before it is moved over the unwanted parts. The eyebrows can be accurately shaped with this method. Threading involves the removal of multiple strands of hair, which is different from tweezing. Tweezing involves removal of just one hair strand. It is more suited to remove one’s facial hair as it works with a little group of hair. Heal from Within: The deep hair conditioning therapies makes the hair follicles strong and improves the roots. Increase in the growth of hair: A hair spa massage treatment renews the scalp, which helps in hair growth. Improving blood supply: Hair massages leads to good circulation of blood and aids in the development of healthy hair. Nourishing hair: The hair spa treatment products gives the hair a shine and nourishes the hair. Longer lasting colours: A hair spa treatment nurtures the hair cuticles, moisturises hair length, and promotes hair growth. If one has his/her hair coloured, a hair spa treatment would be beneficial as the colour would last longer and would look new even when hair has been washed a couple of times.